It is with great sadness that I am letting you know that my husband Bernie Vacura passed away on October 23, 2017 at the University of Nebraska Med Center in Omaha, Nebraska. 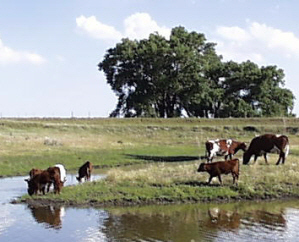 A local rancher is planning to rent the pastures and purchase our shorthorn herd. I always joked that Bernie would own cattle until the day he died, and in the end that became our reality. 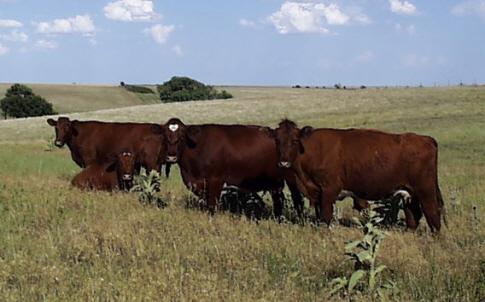 The Vacura family has raised registered Shorthorns for four generations on their ranch near Jennings, Kansas. The cattle in our herd are among the best you can purchase throughout the United States and even North America. Our bulls have the genetics that give low birth weight and fast weight gain in calves. As any cattleman knows, those two features are of prime importance in running a cow-calf operation. Calves in our herd who are only a few weeks old show the confirmation and stance that is desired in the show ring. Heifers and steers from our herd are an excellent choice for 4-H projects. Every year we sell quality shorthorns similar to the ones shown in this video below which shows our 2015 replacement heifers. Heifers like these sold by private treaty in Fall, 2014 and Fall, 2016. Certain select replacement heifers are for sale NOW at the beginning of 2017. Contact us early to get first pick.